Being prepared can make or break a homeschool year. Benjamin Franklin once said, “If you fail to plan, you are planning to fail.” Whether you think it’s fun or you dread it, homeschool planning is a necessary part of homeschooling. I’m hopeful that these Homeschool Planning Tips for Busy Moms will help you prepare for your next school year. Disclosure: This is a sponsored post on behalf of Plan Your Year and I was compensated for my time. I was not required to post a positive experience and I truly do use this product in my homeschool. 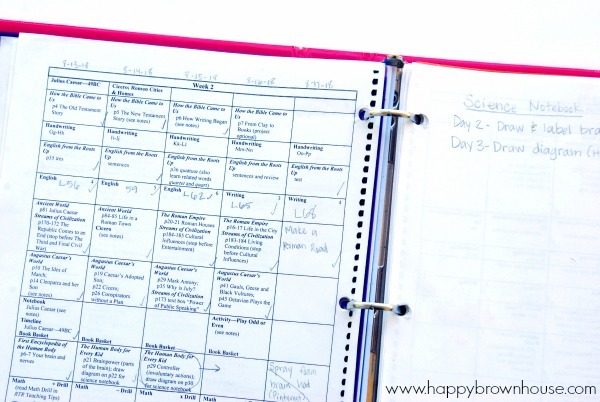 Over the years I’ve developed a system of how I plan for our homeschool year to help me be a successful homeschool mom. 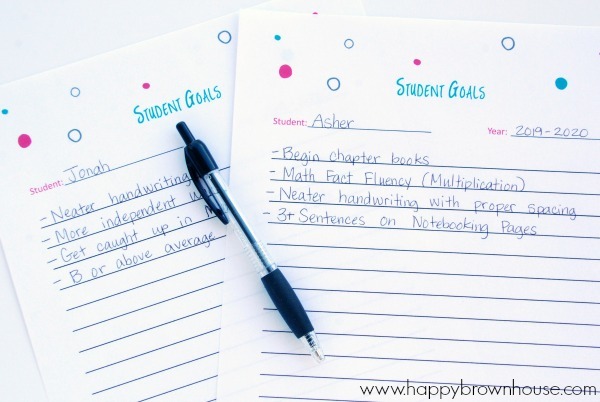 I’ve had to be really honest with myself about my strengths and weaknesses when it comes to preparing for the school year and our daily homeschool routines. I’ve come to realize that if I skimp on the planning there are certain things that won’t get done. 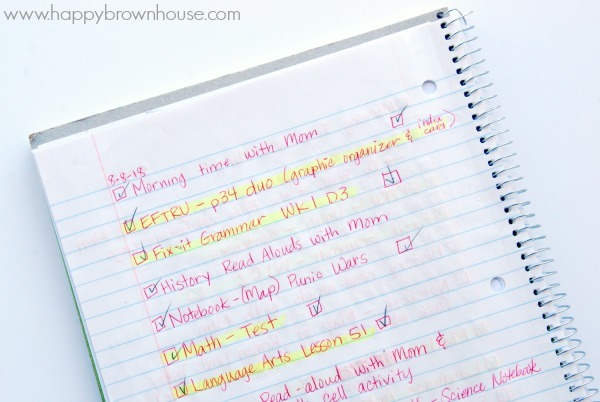 So, what are these homeschool planning habits? Summer homeschool planning. 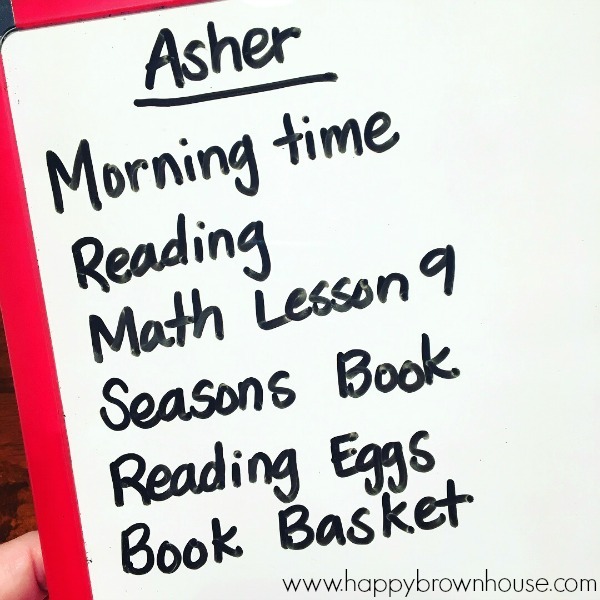 While there are some things that I have to do daily to keep our homeschool days running smoothly, I will do the bulk of my planning and preparations for the school year in the summer. I can usually knock it out in a couple of weeks and then I only have to tweak things here and there throughout the school year. I personally hate planning unless it involves scrolling through Pinterest for fun ideas, so these intense summer planning sessions are the key to my success. 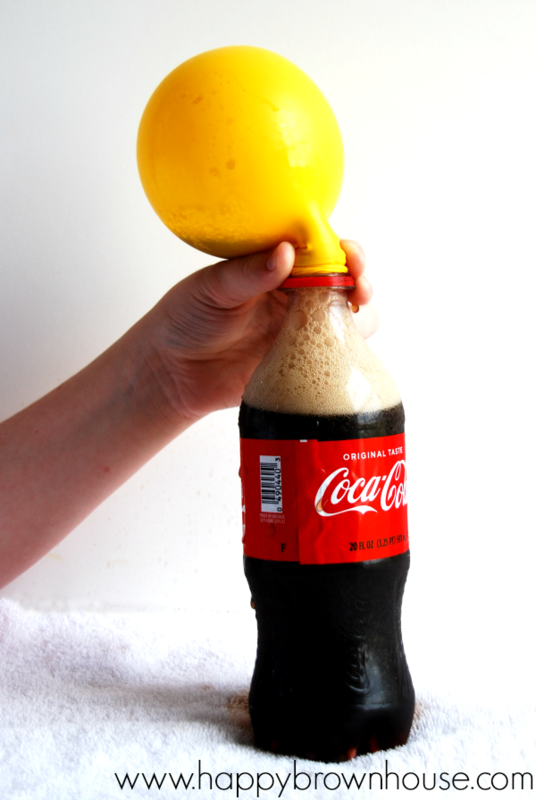 It’s kind of like when my kids hold their noses while they take medicine–I get it over with in one big gulp. 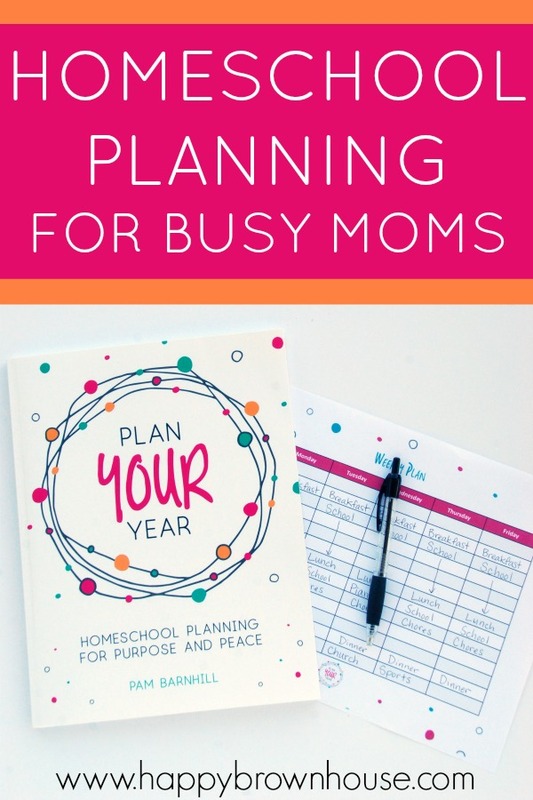 I sit down with the Plan Your Year Homeschool Planning Printables, my teacher’s manuals, a big drink from Sonic, and don’t do anything else until I am done. These Plan Your Year forms help me get laser-focused on what I want our school year to look like. I fill out these homeschool planning sheets before I get to the daily lesson plans. I make goals for the kids based on my assessments from the previous year, make a list of all our curriculum resources, and finalize our daily school schedule. I will print out the calendar and mark the days that I plan to take off from school based on any trips and holidays that I know my husband will not be working so we can have family time. The newly updated and expanded Plan Your Year book is now in print and is available on Amazon or you can buy it directly from Pam’s website. 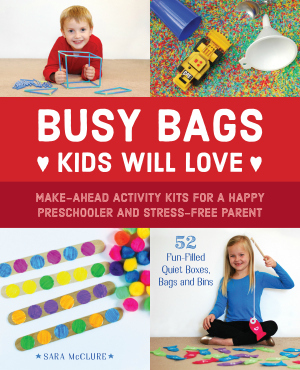 It’s an easy read that’s packed with lots of great ideas for planning your homeschool year. 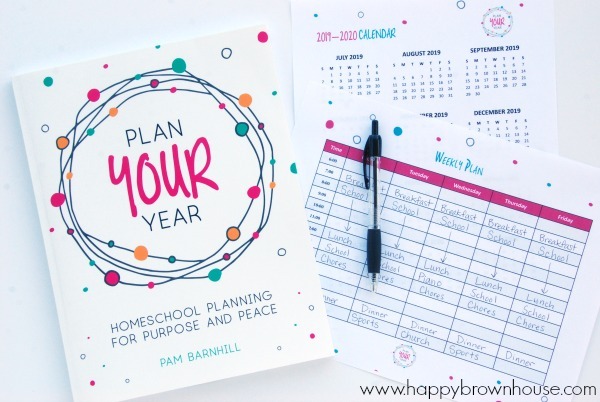 There are FREE Plan Your Year Homeschool Planning Forms available, but the printable homeschool planning sheets that I use the most are available for purchase. They are fully editable, meaning you can type on them before you print them off. I am more of a pen and paper girl, so I write on mine. 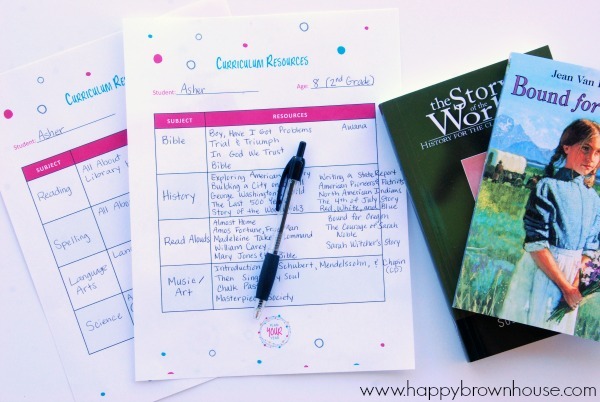 Our homeschool curriculum comes with a weekly grid of the assignments. I am not a slave to these assignment grids, but I am somewhat lazy. I don’t like to write in my teacher’s manuals and I also don’t like to rewrite all of the daily plans in a homeschool planning grid when it’s already on a grid, so I make a copy of the assignment grid and put it in a three-ring binder. I hole punch the pages on the right side of the page so that I can have my assignment grid on the left hand side and use the back of the page of next week’s grid on the right hand side to make notes of my extra ideas. I will often make a list of field trip ideas and make a note of any hands-on projects that I want to do in addition to the ideas in our homeschool curriculum. I also include all of the Plan Your Year forms that I’ve used in my summer planning session. If your curriculum doesn’t have pre-written plans, you can still set up your lesson book similarly. Use the planning forms from Plan Your Year to write your lesson plans. There are lots of ways to plan and Pam highlights some of these different methods in Plan Your Year. The key to planning out your daily lesson plans is to take the curriculum resources and break them up into manageable chunks. For some things, you’ll simply do the next lesson. Others you will need to divide the material into the number of weeks available. Be realistic about how much your kids can get done in a day. Another way that I prepare for the school year is to print and organize any pages the kids will need throughout the year and place them in file folders by week. These pages include the student pages from our curriculum, notebooking pages, tests, map work, coloring pages, and more. My file box set-up has changed every year depending on the needs of the kids. For example, when I was only teaching one child I had a small file box. 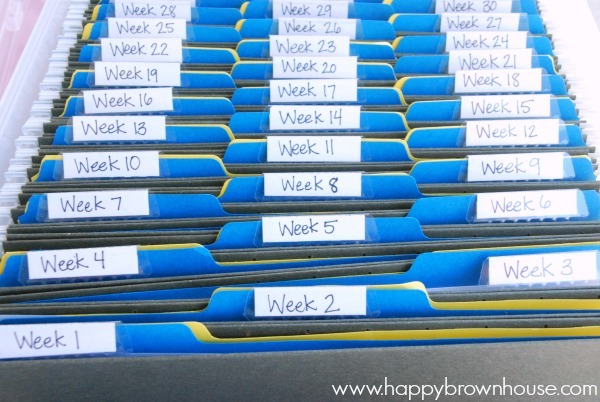 When I added another child, I moved to a larger file box with hanging files labeled for each week with color-coded file folders inside for each of the boys because I was teaching two separate curriculums. These pre-filled file folders have been a lifesaver! I don’t have to hunt for things all throughout the year because I’ve prepped it all ahead of time. I simply grab the next folder and get busy teaching. It’s a little work ahead of time, but it is so worth it to me to have it all done before school even starts. I encourage you to give it a try. I’m about to tell you something that will change your life. Are you ready? I have found pre-made science kits that go with our science curriculum. Everything you need for the year is in the box ready to go for the year. Can you hear the angels singing “Hallelujah”? This has been a game-changer for me. I’m rather scatterbrained and will often forget to grab the science materials which means I will end up skipping the science experiments. Not good. I decided to pay for the convenience of the curriculum science kit to help me out. It’s been life-changing. Seriously. Can’t find a pre-made science kit for your science curriculum? Make your own. Go through the curriculum and make a list of everything you need for the year. Purchase it all at once and you’ll never have an excuse to skip science again. If you’re feeling especially ambitious, place everything for each science experiment in a plastic bag and label it. Then, when it’s time for a science experiment you simply grab the bag and teach. See? Game-changer. This kind of goes with the pre-made science kits, but covers the materials you’ll need for other subjects. If you have the storage space, gathering all of the nonperishable items you’ll need throughout the year is a great way to make sure you do the activity. If you don’t have the storage space, maybe gather materials a month at a time to take up less space. For example, I needed to have 15 empty pudding boxes to build a Roman Arch when we were studying Rome. I purchased them at the beginning of the year so we would have time to eat the pudding and save the boxes. The great thing about this is that you are more likely to tackle the project if you already have the materials. I’m notoriously forgetful, so I’ve learned I have to do this. There is a Resource List in the FREE Plan Your Year forms where you can make a list of all of the resources you will need. This is especially helpful if you don’t have the storage room or the budget to gather materials ahead of time. Another great way to get prepared for the school year is to search the library and make book lists. Our library system’s website has a handy feature where I can make book lists ahead of time. Since we are usually studying a particular topic for a few weeks at a time, I will make a unit study book list that includes all of the books I want to check out. 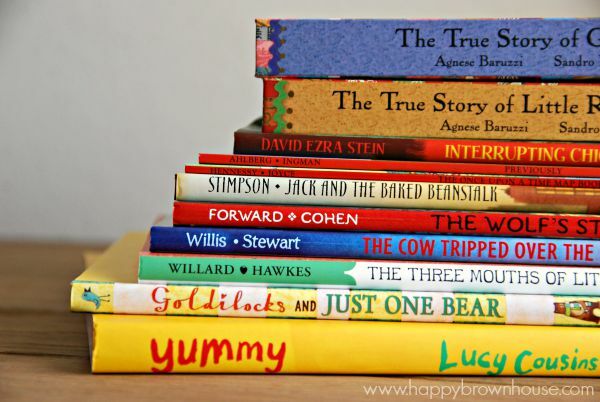 When it is time to use those books, I will then reserve the books with a few clicks of a button. This is a lifesaver! I like to add YouTube videos to our homeschool lessons, but I like to pre-screen them before showing them to the kids. This helps keep the junk out. Making YouTube playlists ahead of time saves me time in the long run because I don’t have to search for videos every day/week. I sit down with my teacher’s manual and the books I will be using and start searching for videos. On YouTube you can write a note for the video, so I write the week and day that I will need it. I put all of the videos in the order that we will watch them so I don’t have to search my playlist. If you need help setting up a YouTube playlist, I’ve written about it before with instructions for How To Make a Homeschool YouTube Playlist. 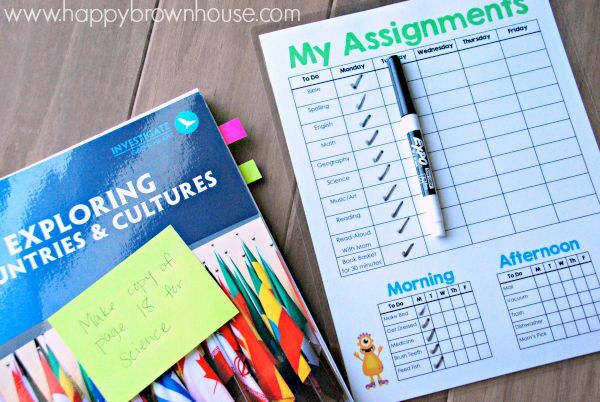 Eventually you will need to use all of these plans with your kids, so the Daily Assignment Notebook or Chart is my favorite tip yet. Letting your kids know the plans can give them a sense of ownership for their learning. You have to plan how you will organize your kids and share these plans with them. Pam mentions some options for this in Plan Your Year and Sarah McKenzie from Read Aloud Revival has written on it as well, but I’ve been doing this in some form or another since the beginning of my homeschool journey. At the beginning of my homeschool years, I had a chart with velcro where I put pictures of the day’s activities. As we finished an activity, the boys would take the picture off the chart. This was a great visual for them to see how many activities we had left in the day. They knew when the chart was empty they could go play. This works well for young learners. You can find a Weekly Workbox Grid Chart and Workbox Picture Tags similar to what I used from Homeschool Creations. As my oldest matured and started to do independent work, I moved to a list of the day’s assignments that he could check off. Like Pam and Sarah, I use a simple spiral notebook. This has helped my oldest take charge of his learning while still giving him an idea of how much he has left for the day. This way there are no surprises. It also helps him know what to do when I’m busy teaching my youngest without having to wait on me or interrupt me. I have also used a Homeschool Assignment & Chore Sheet that I made as a transition between the workbox grid and the spiral notebook. This still gave my oldest a visual and place to check off his subjects before he was independent enough to do his work without me. I laminated it and he used a dry erase marker to check off his subjects. Another thing that I have done for my youngest is write the subjects on a small white board. Then, he erases them as we finish that activity. He really likes this and it’s so simple to set up. In the end, the best homeschool plan is the one you will actually use. Figure out your strengths and weaknesses and brainstorm ways to set yourself up for success. Doing all of this planning and preparations before our school year even starts helps combat the homeschool burn-out I struggle with in February. It’s saved my bacon more than once. It’s totally worth the work and it gives us a richer homeschool experience because I’m not stressed about preparing for the next thing. I highly recommend it! If you are ready to start planning with purpose and peace, the newly updated, print version of Plan Your Year will release May 7th. Order Plan Your Year by May 6th to get your free Plan Your Life Companion plus a special coupon code off the Put Your Mornings on Autopilot Course. Plan Your Year is available on Amazon or Pam’s website. Don’t forget to download your FREE Homeschool Planning Pages to help you get started right away.